This entry was posted in Blog Uncategorized and tagged re-cap Stan Lai playwright on February 19, 2013 by arc_berkeley. 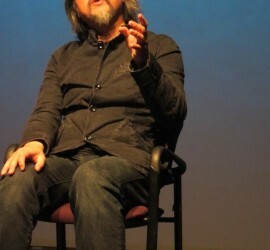 The Arts Research Center saw a whirlwind of activity in recent weeks, when Taiwanese playwright/director extraordinaire (and UC Berkeley alum) Stan Lai came to campus as an ARC artist-in-residence and Avenali Resident Fellow January 28 through February 8, 2013. A photo album capturing some of his activities can now be viewed on the ARC Facebook page. Lai’s residency kicked off with a public conversation at the Institute of East Asian Studies titled Theatrical Engagement. An online video of Lai’s exchange with the distinguished historian Wen-Hsin Yeh, Director of IEAS, is now available.